48% of candidates drop out of applicant tracking systems when applying for a job. 65% of candidates who job search on a mobile device will leave a non-mobile optimized site. 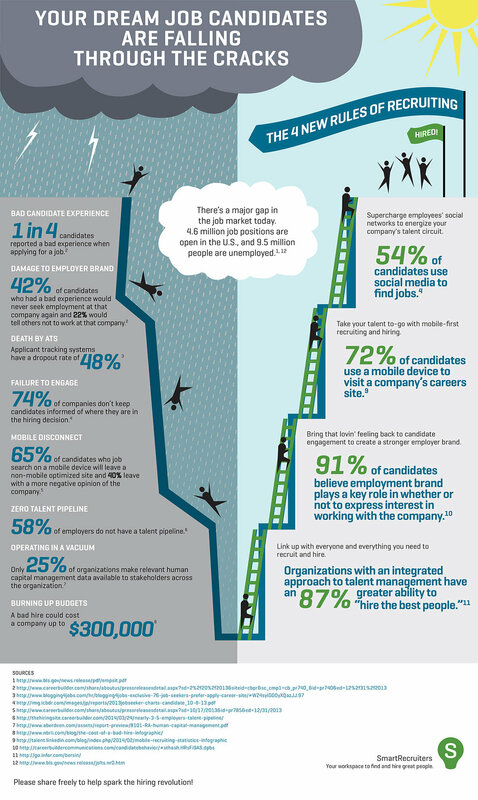 42% of candidates who had a bad experience would never seek employment at that company again. As a result, businesses are losing tens of thousands of dollars due to bad hiring decisions and are missing opportunities to attract the best talent. Add up all these problems, and it’s clear that recruiting and hiring technology is broken. The good news is, there are ways businesses can overcome these challenges. Central to the solution is making the entire recruiting and hiring process more social, collaborative and transparent. For instance, hiring managers’ social networks can be talent goldmines. Businesses can better connect via mobile to easily access their talent pool fort hiring managers to quickly find great candidates. Also key is putting candidates first in the recruiting and hiring process. Businesses aren’t the only ones making a decision; so are candidates. That’s why it’s crucial to engage candidates in a positive hiring experience where they feel welcomed and important. Feel free to share the infographic if it strikes a chord with you and how you'd like to see recruiting and hiring evolve for the benefit of hiring managers, recruiters and candidates all around. It’s time to spark a hiring revolution!